Britain recorded its worst productivity performance in five years in 2018, deepening a problem that has plagued the economy since the financial crisis. Output per hour increased less than 0.5 percent, half the pace of 2017 and the poorest reading since 2013, according to Office for National Statistics data published Friday. 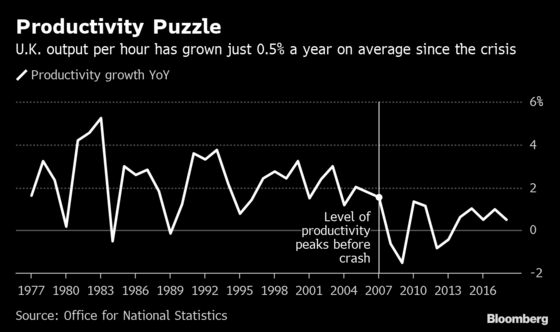 Weak productivity has hampered the U.K. for a decade, depressing wage growth and restricting how fast the economy can grow without fueling inflation. Hourly output would be more than a fifth higher today had it followed its pre-crisis trend. Annual productivity growth has averaged just 0.5 percent over the past nine years compared with over 2 percent over the same period prior to 2008. In the fourth quarter, output per hour was 0.1 percent lower than a year earlier, the second consecutive decline. With firms’ payroll bills now outpacing productivity growth, cost pressures are building. Unit labor costs grew 2.7 percent last year, the most since 2009. The Bank of England has highlighted the risk that this could push up inflation but Brexit chaos is expected to keep policy makers from raising interest rates anytime soon. 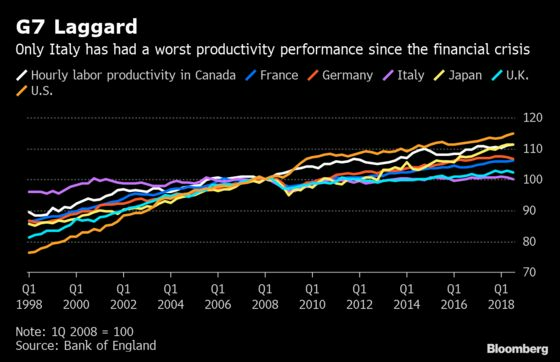 Britain is far from the only advanced economy to be grappling with poor productivity growth, but it nonetheless lags well behind all of its Group of Seven peers bar Italy, with hourly output barely higher than its pre-crisis peak. It takes a British worker five days to produce what a French worker makes in less than four. And there are fears that leaving the European Union could see Britain fall further behind by depriving the economy of productivity-enhancing foreign innovation and investment. One explanation for the weakness is that Brexit uncertainty is prompting companies to take on workers instead of investing in capital equipment, as hiring decisions are easier to reverse if there is an economically damaging departure from the EU. Productivity growth was faster in services than in manufacturing last year. Employment stands at a record high but signs that the labor market may be cooling emerged in a separate report Friday, which showed that permanent placements fell last month at their fastest pace since the 2016 Brexit vote.